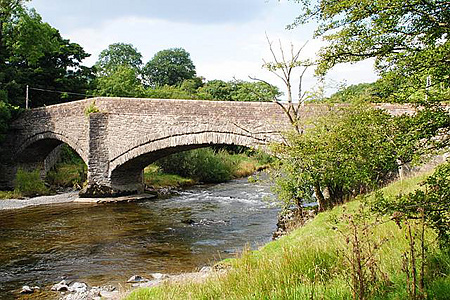 Combine Cumbria camping with Yorkshire Dales camping at Cross Hall Farm and enjoy not only our local Howgills but two national parks in the one camping holiday. (Yes our address is Cumbria, and the Lake District is nearby, but we’re actually in the Yorkshire Dales National Park). Alongside our caravan park we have a separate field dedicated to camping tents. Close by is a shower and toilet block with a dish-washing facility at the rear and we pride ourselves on the cleanliness of these facilities. Discounts also available for large groups e.g. Cadets, Scouts and walking groups. Responsibly managed camp fires permitted. No WiFi on the camping field. If you are booking well in advance you can either phone or use the contact form here on the website. If it is a last-minute booking it will be better to phone us at 01539-620668. Cross Hall Farm lies at the foot of the Howgills, at Cautley near Sedbergh in the valley of the River Rawthey. Are you thinking of arranging a holiday in Cumbria? Camping can be a great way to get away from the crowds ... if you choose a quiet site, and that is what we have here at Cautley, a quiet family-owned site surrounded only by the hills. Camping in the Howgills provides a great range of options for your holiday whether you just want to walk on the fells locally or travel around using this as your base. Although our address is Cumbria we are, through an historical quirk, located in the national park not of the Lake District but the Yorkshire Dales. Our Cautley camping field gives you easy access to walks on the Howgill Fells, to Wild Boar Fell and the Eden Valley while lakes such as Haweswater and Ullswater are not far away and Wensleydale is the nearest of the major Yorkshire Dales. Camping at Cross Hall Farm has a lot to offer. There are many campsites in Cumbria for tents but not many that give such convenient access to such varied landscapes, from mountains in Cumbria to the moorlands of the North Pennines and the underground limestone caverns of Yorkshire.